came prickling into our hearts. Synopsis: Each two page spread of this marvelous book features a detailed, realistic yet mystical illustration, a poem, and succinct information depicting some creature of Minnesota in winter: tundra swans, snakes, snowflakes, moose, bees, beavers, ravens and wolves, voles, trees, chickadees, snow fleas, and skunk cabbage. This seems an unlikely grouping of subjects, but it works. They are tied together by the winter wind and snow that swirls through each page as well as by the magical poetry that captures the imagination and allows the reader to feel with the creature just what winter is like. Kids (and others…) will enjoy searching each illustration for the fox – he’s there on each page, if you look very carefully. The well-researched, easily-understandable information about each creature is an added bonus. 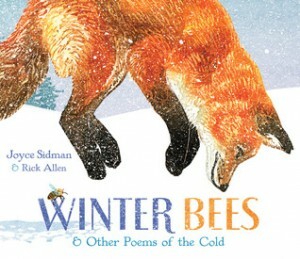 I found it fascinating, for example, to learn how bees get through the winter. There is also an excellent glossary at the end of the book, which includes the names of the poetic forms used for the poem about beavers (a pantoum) and the one about skunk cabbage (a triolet) as well as defining some of the nature terms encountered in the book. Activities/Resources: How about going for a track-tracking walk? If you live where there is snow, it is quite easy to find animal tracks, even if you live in the city. I often see rabbit tracks just down the block, and a park provides even more opportunities. Out in the country, there are all sorts of tracks that one might see. The Amazing Kids Magazine’s website has a great post about identifying animal tracks. The author, Joyce Sidman (who also wrote the wonderful Red Sings from Treetops, among other books), has a teacher guide at her website. Here’s a link to all her classroom guides, and here’s a link to her website’s page about Winter Bees. Other great activities would be to have kids write their own poem about animals or illustrate an animals-in-winter scene. Availability: Readily available in hardcover at independent bookstores such as Wild Rumpus in Minneapolis, Minnesota, and elsewhere. You had me with the fox on the cover! And poetry…ahhh…I’m putting it on my to-read list. Thanks, Beth! My friend gave me some money for a book and I was almost going to get one about water. Water rolls, Water rises but this sounds a bit better. ooh decisions. This is a beautiful winter share for kids. It has an engaging cover, so I can only imagine that double-page spreads are realistic and stunning. Wonderful way to share poetry with kids. Love your idea about tracking animal prints in the snow — one of my very favorite activities as a child. This is such a lovely book. I have a copy. I am a huge fan of Joyce Sidman. Glad to see the word being spread. As writers we hear that concept books aren’t in demand, but then we see beautiful books like this being published! Thanks for pointing this one out. I admit I’m sweet on foxes, but that cover is marvelous! And since we are expecting a little heat wave in northern Colorado, I can picture reading this selection without getting the chills! I’ve seen this book mentioned a few places and NEED to find it. Thanks for sharing – it looks great! Beautiful cover and story. It reminded me of a video clip I was watching the other day of a fox jumping in the snow obviously chasing something. I could watch it for hours. lol. Thanks for pointing this one out. I hope my library has it. This one sounds lovely – and the combination has my interest piqued for sure. Thank for adding this one to the list! On my “definitely read” list~ the title hooked me, and the fox. I love Joyce Sidman. I’ll have to find this one before it warms up too much. It was 80 degrees F in Los Angeles yesterday!